The trends in the world of marijuana are continually changing, and it seems that brand new strains are popping up every other week. Generally creating quite a buzz when they “reveal themselves” to the world, these new strains often overshadow the hundreds of incredible and useful cannabis types that already exist. In fact, it seems that sometimes these classic cannabis strains can be silenced by the hype of “fresher,” newer products. However, there are a few timeless marijuana strains out there that are known to nearly every cannabis enthusiast – even the newbies. Whether these strains have earned their iconic status and have impressive reputations due to their unique properties or successful genetics, they’ve made an impression on the cannabis community in one way or another. Or whether they have a recognizable and potent aroma, an abnormally high THC content, or they spoil growers with exceptionally large yields, they’re sure to provide you with a level of glee and jubilation that you’ll remember for many, many years to come. 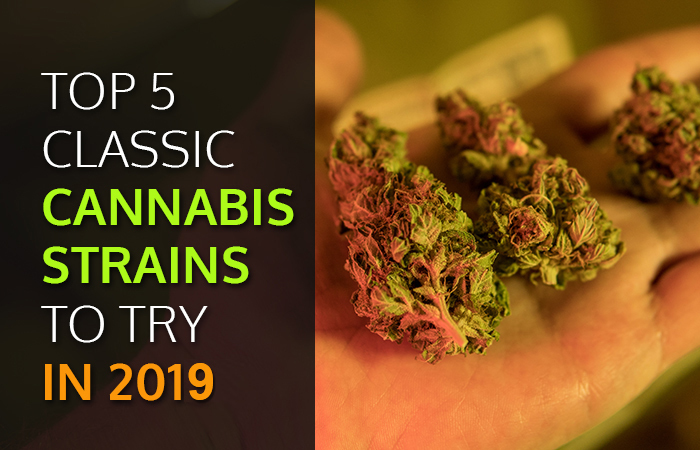 Without further ado, here are the top 5 classic cannabis strains to try in 2019.